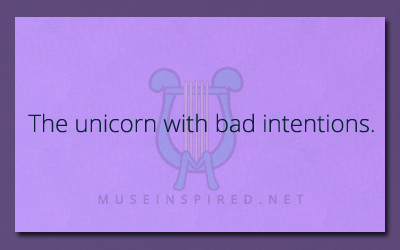 Unicorn - A Unicorn with bad intentions. What's the story? The unicorn with bad intentions. What’s the story? Unicorns in stories are usually depicted as creatures of goodness and light. Often only seen by innocent virgin damsels. But what would you get when the unicorn isn’t so nice? Unicorns are unique in that they don’t seem to have an origin story in mythologies. They also have only ever been depicted as good creatures. Not a monster or frightening beast like most fictional creatures of legends. What's the Story - Sleet pouring down the roof of a train stop that is no longer in service. What's the Story - A farm with an unwanted guest.